One of the main textiles of the period was wool. The woollen industry had flourished for centuries in Wales, mostly under the control of the abbeys. However, during the fifteenth century, it became an industry on an even larger scale (see Agriculture: Animals). Mid Wales became an especially important area for flannel production due to the rapid development of the woollen industry in towns in the Marches, such as Oswestry and Shrewsbury. Flannel is distinctive because of its adaptability: it is possible to produce all sorts of items from it. However, home-spun cloth was most commonly used for garments such as tunics, trousers, socks and cloaks. After the farmer had sold his wool it would go through a process of fulling and spinning. Fulling cleaned and thickened the cloth. Beating the cloth several times for a prolonged period (or ‘felting’ the cloth) would ensure that the wool would remain relatively dry in the rain. The quality of the finished flannel or cloth depended on the quality of the raw wool as well as the success of this process. The poetry reflects all of these stages in the preparing of the finished cloth, and occasionally there are references to the objects used during the process (see, for example, poem 24.43). Guto’r Glyn notes that the ‘fulling was well done’ when he describes the Irish mantle he received from Elen daughter of Robert Puleston of Llannerch (poem 53.62). Indeed, other references to Irish mantles in the poetry indicate that they were particularly good at keeping out the rain. full woollen cloth, mottled white and grey. Woollen cloth of the best quality was smooth and soft, had taken the dye well and had been treated carefully. This type of cloth would be worn by the nobility, often decorated with embroidery. Frieze was a type of coarse, shaggy cloth, more suited for items such as blankets or winter clothing. This was the material used to decorate the edges of the Irish mantle Guto received from Elen daughter of Robert Puleston (poem 53.50). Frieze was also used to make whole items of clothing. Guto compares the rough fur of the greyhounds he requested on behalf of Sieffrai Cyffin to frieze: Milgwn Ffrainc mal gynau ffris ‘French greyhounds like frieze gowns’ (poem 100.47), and there are many descriptions of frieze by other poets too. 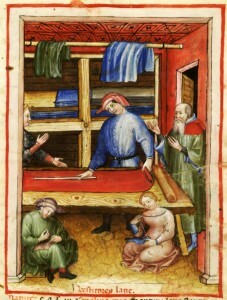 The poorest cloth produced from flannel was called carth in Welsh. It was a rough cloth made of hemp which was associated with the common people. The word carth is often used in satirical poems. To humiliate Dafydd ab Edmwnd, Guto’r Glyn describes him as being dressed in a shirt of carth (see poem 66.53).